Barfoot & Thompson says buyers are becoming more selective. 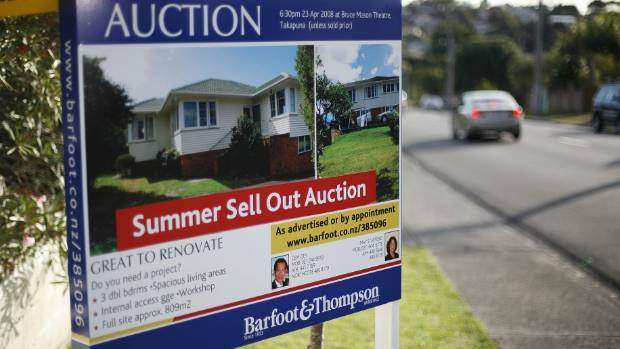 Auckland real estate agency Barfoot & Thompson recorded its slowest October in five years last month. The agency said buyers had become more selective but were still willing to pay the asking price for the right property. "In October the rare situation developed where the average sales price set yet another record while sales numbers fell to their lowest in an October for five years and available property for sale reached its highest number at month-end in three years," said Peter Thompson, managing director of the firm. "It is a combination of factors that hasn't come together for many years. The last time sales numbers fell this low in an October was in 2011 when the market was still not fully recovered from the 2007 Global Financial Crisis. It is yet another sign the Auckland market is losing its forward momentum." Almost 40 per cent of the agency's sales were for more than $1 million and that lifted the agency's average sales price to $943,801. That is up 12.3 per cent on a year earlier. The agency's average sales price tends to be higher than the market as a whole because of the listings it attracts. Barfoot & Thompson reports its sales figures ahead of official measures such as the Real Estate Institute and Quotable Value, and gives an early guide to the direction of the market. There were only 778 sales in the month, more than 25 per cent down on September. "Where buyer resistance to prices has been felt most is in the under-$1 million price category. Greater choice has created an environment where buyers feel less pressure to pay the asking price," Thompson said. "This is reflected in the median sales price for the month which increased by 1.8 per cent in the month to $865,000. This compares with the average price increase for the month of 2.6 per cent." The agency's median price has increased 10.9 per cent over the past year, compared with 17.4 per cent in the 2015 year and 11.1 per cent for 2014. Thompson said lending rules requiring investors to have a 40 per cent deposit had slowed their activity. "The new loan-to-value restrictions investors must meet has had a significant impact on sales in the under $500,000 price category. In spite of there being a reasonable selection of properties available only 40 homes, or 5.1 per cent of all properties, sold for under $500,000," Thompson said. "With the normal spring lift in sales activity failing to arrive this year, the relationship between buyers and sellers has moved into a more balanced position. At month end we had 3711 properties listed, 21.3 per cent higher than at the end of September."